1. Before considering creating a transmedia symphony, you most know a lot of the theory behind the storytelling and the structure, as well as the analysis of audiences and the different media platforms. If you have done this, follow the next steps. 2. Be inspired. Take some time, relax, bring som inspirational material with you somewhere and create. Wherever you are, when the ideas suddenly pop up in your mind, write them down, no matter how small. Keep letting life inspire you until you have a bunch of these ideas. Try to make your ideas connect with people on an emotional level. 3. You’re going to need some good writing and scheduling software. Set up your project thoroughly, with all the different elements in place from the beginning. In this way you can see how they fit together, and where strengthening is needed. The base of the project is the story and a couple of platforms. Unless you’re taking on a massive Hollywood project you shouldn’t need to worry about every possible platform and outlet. It’s all up to you, what you want your project to look like and how you want it to be perceived. 4. When you’ve selected the platforms you want to work on, go back to your ideas. Expand on them, build the world around them, put them in the middle of some context and think about how you would like to introduce them, and how you will digress from them as the narrative rolls on. Which ideas would be best at the beginning, or in the middle of the narrative? What should be the grand finale? Slowly add onto these ideas and interlink them. Make sure to stay within logical boundaries and watch for errors that would throw an audience off. This is of course unless you really feel you want some of these. Many creators throughout history have sought out theoretical guidelines, but if you encounter an opportunity to do something which breaks the rules but really feels right to you in the context of the piece, you might want to leave it in. 5. Eventually you will have a number of different, fleshed-out ideas going on. Try to get them all work in the same context, yet have their own unique style. You will use this to develop the different movements of your work. Keep expanding on these ideas, adding subplots, side characters, and so on. Watch and study other great transmedia projects to hear, see and feel how they progress, to help give you ideas of your own. 6. Eventually each idea will become a decently long plot. Do a walkthrough of all the different parts of your project. Does it flow right? Change and fix anything that does not feel right. Remember the interlinking of the different parts and how they should exist in the same story world and fit logically in the same context. Keep refining your project until it is complete. 7. This creative process may take a while, but by this step you should have a fully developed transmedia project down on paper. Take it to a group of people you know closely, or perhaps a group of students, and narrate the project to them, or ask them to partake of any material you have produced so far, like written text, graphic novels, online portals etc. Observe them partake of your idea. Did they experience it like you expected? Were their reactions the desired ones? Make sure you have the possibility to write down comments and reactions on the spot. 8. Go back to your transmedia mess and make a second draft with the comments and reactions taken in. Repeat these two steps until you are satisfied. 9. Take it to someone in the industry. It depends on your idea, but could be anything from a broadcaster to a production company, from a publisher to a telecom operator, depending on your idea and the platforms you’re concentrating on. Rehearse your pitch well, and reel them in with your great story and magnificent execution. 10. If you get traction and commissioning (or at least adequate funding) - Voila! 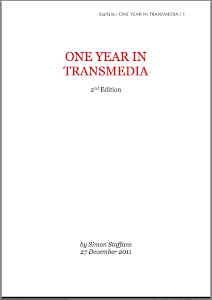 Time to unleash your transmedia symphony on the world! I would like to add to point three: learn the correct format for screenplay, comic book, treatment and so on, and put together your materials in an organized manner. Even if you plan to produce independently rather than pitch to the institutions, you still have to show it to potential collaborators. Nothing is more disconcerting than a confusing, disorganized binder full of chicken scratch and badly formatted documents. Well, yes. And that is a skill all to itself, the art of gathering a bunch of brilliantness and get it down to a format that is no less brilliant, but that will be equally brilliant to anyone viewing / reading / hearing it.